interest that has stayed foremost with me ever since. The plan was; by getting to grips with Zampogna I would have a better idea how to create a set of my own pipes with more of (dare I say) an “English” look and musical character about them. 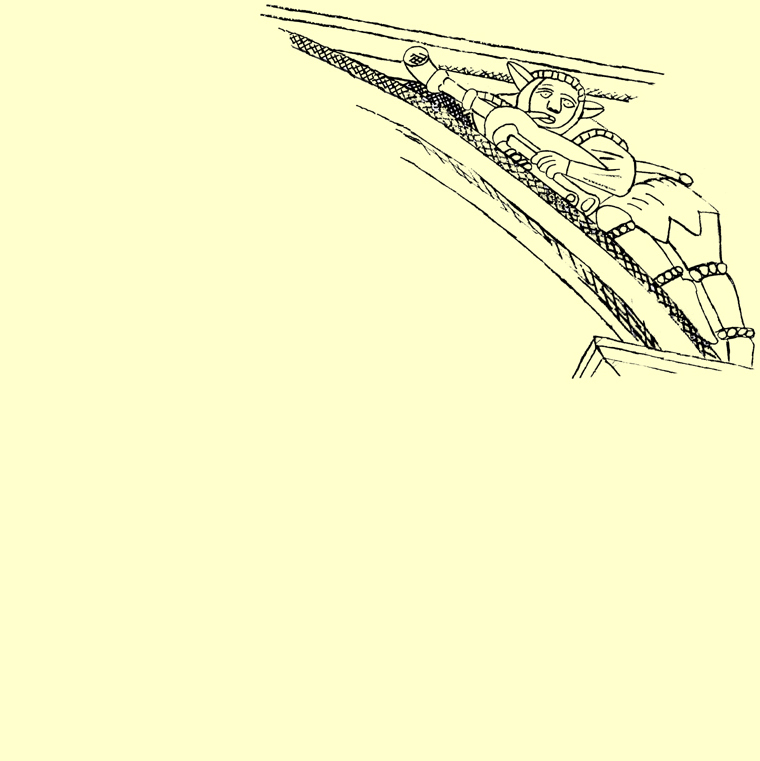 However this is not to say that Zampogna were far removed from what I needed to fulfil that aim. They have, as an instrument, survived in southern Italy relatively unchanged (if the artwork is anything to go by) since at least the 16th century. Perhaps one of the few differences with what they are and what I needed was that they have both chanters playing almost the same run of notes (G-D & F#-D) but an octave apart thus making them work towards producing a simple melody backed by a simple bass line, whereas the depictions we have of Double Chanter pipes in England suggest a single octave split in the middle between the two hands with some notes overlapping in the middle between those two hands. A set of Zampogna were made for me by Marco Cianciaruso, Chiasso, Switzerland in 2006 and then in 2009 I made my first version of what has become a great musical discovery (well, at least for me - should get out more really!) These are, in fact, the pipes you are, I hope, listening to at present and what you see below. It then took me several more years to get round to creating my second set as our "Great Project" took over! In 2015 I made another set of double chanter pipes this time using single reeds on each chanter as opposed to the set you see below which uses double reeds (what produces the sound of a clarinet as opposed to an oboe). However, before the great love affair with Double Chanter pipes I played the more "normal" kind, ie. two hands playing upon one stick. 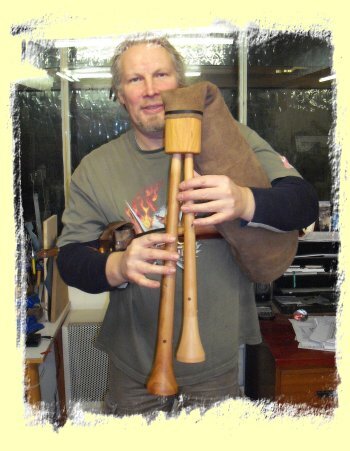 The single chanter sets I owned were both made by Sean Jones (see links page). 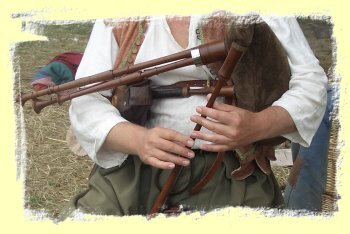 The smaller of the two, called “small pipes” or “Dudey”, using a tonic in D, has a straight bored chanter and a relatively large reed producing a softer sound. This system went onto develop into the Northumbrian bagpipe. The second Jones set (pictured right), larger in general, has a conical bore chanter with a smaller, harder reed producing a more shrill sound. These are in G and known today as “Border Pipes” though similar instruments had been in existence widely throughout Europe since the 16th century. For those bemused by why I never appear to blow the instrument with my own lungs; there are two systems of getting air into the bag. The first, and definitely the older, is mouth blown, the second uses a set of bellows strapped under the arm not controlling the bag and is sometimes called the “cold wind” system. The advantage of using bellows is the lack of moisture (present when using the mouth), moisture that can play havoc with the reeds that produce the basic sound. 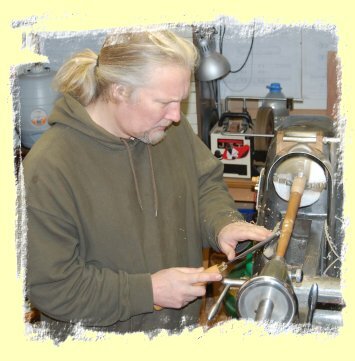 Bellows were in use as early as the 1500s and it is the principle method I use as it allows a more stable instrument.